The United Nations has declared May 22 as the International Day of Bio-Diversity. While bio-diversity is essential for the survival of life on earth, efforts are being made to preserve bio-diversity and conserve ethnic ecology by some institutes. The efforts made by the Botany Department of the Andhra Loyola College (ALC) to preserve the existing species of flora and gather more for the purpose of educating its pupils has turned the college campus into a veritable bio-diversity hotspot. 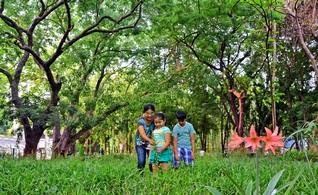 Botany Department head B. Siva Kumari said the number of plant species that grow on the ALC campus has increased to 1,000. The 98-acre campus has over 800 trees that belong to 180 different species. “Even Kondapalli forest does not have so many species of trees, but all most all the different species of trees that grew in the forest were in the campus. The remaining species are shrubs and herbs”. Over the years the botany department with the support of the college management has developed a botanic garden with 300 different species of trees and shrubs in a two acre stretch. A separate herbal garden with 75 species of herbs, many of them with medical properties, has also been developed. The campus has a few trees of the highly precious and endangered Pterocarpus santalinus, known to all as the Red Sanders. There are few trees of Mitragyna parvifolia, a relatively rare tree, also. The Cannonball tree (Couroupitaguianensis) is a highly exotic looking tree. The bunches of ‘Nagalingam’ flowers and the big, round fruits that give the tree the name are a sight to behold. The flowers are borne in huge bunches sometimes covering the entire trunk of the tree. Ficuskrishnae is another tree with leaves that are cup-shaped. The legend is that Lord Krishna used them to eat butter. There is a legend behind every tree and shrub for those who are interested, Ms. Siva Kumari said.